Can you have a 48 hour runners’ high? That seems to be where this is going. 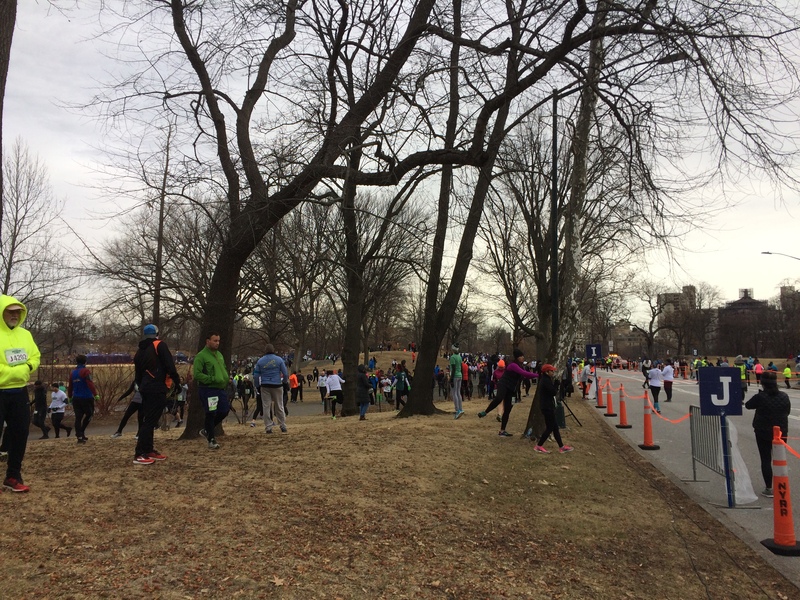 This is also super long so TL;DR: I “raced” my first race today, and it was AH-MA-ZING! This was a(nother) weird week. After Saturdays runs, I walked and went to the gym to use the bike on Sunday but then I took Monday and Tuesday off. I’d planned to go to the gym on Tuesday but I was at work way too late and wasn’t feeling it. I knew it wouldn’t be a good workout, so I went home. I got to visit my graffiti! Wednesday brought my tradition, of sorts. Ryan’s High45 at Mile High Run Club. We celebrated my finishing the Half and he asked my plan for the class. My knee was still a little tender so I wore my brace and said I’d take it on the easy side. He said he wouldn’t call it a “come back” if I wouldn’t. I walked some of the active recovery windows and definitely slow jogged the others, but I took some of the flying sprints at 7.0 and that felt good. I iced it when I got home, but otherwise my knee felt good. I was so glad I got to see my piece of art, as by time class had ended she’s cleaned the wall of the 2018 Resolutions. I look forward to what Team MHRC runs and membership will bring as I really like the folks at NoMAD on Wednesday nights and Sunday mornings. I had after work plans on Thursday, so missed the gym but knew I’d go Friday. I was feeling good about the workout. Even though I’d needed to walk some of the active recovery windows on Wednesday I felt that my level 2, aka my usual pace, could move up so when I got to Blink, I hopped on the treadmill at 5.6 and off I went. At some point I looked at Runkeeper and saw what a 5K PR would be. So at minute 31 I cranked it up to 7.0, and subsequently realized that the problem wasn’t with running so much as math. Although I didn’t PR, it felt really good. 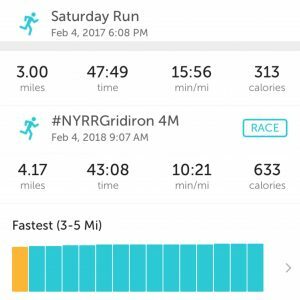 As I stretched after running, I had a scroll back through my Runkeeper to find out what the hell that PR was (this craziness with NYRR, so this is definitely a treadmill PR and longer distance) and because I thought early February was when I’d first run a full three miles. Indeed. 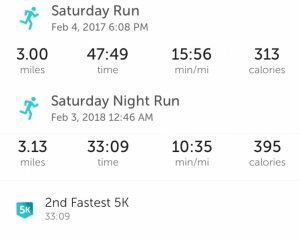 Other than chasing treadmill PRs, I really hadn’t had the chance to see running growth due to the frigid weather and running longer/new distances. I didn’t really have an exact plan for the Gridiron 4M because I was waiting to see how I was feeling after the Half, but now one was formulating. When I ran the 5M in late October I nearly got a mile “free” and I decided that was my goal for today. 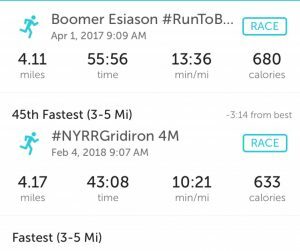 I wanted to either beat the run from the previous Feb 4, or my time for the Boomer Esiason four miler, my only prior 4M with NYRR. I took Saturday “off” and just did some errands. I was worn after a lot of late nights this week and needed some me time. 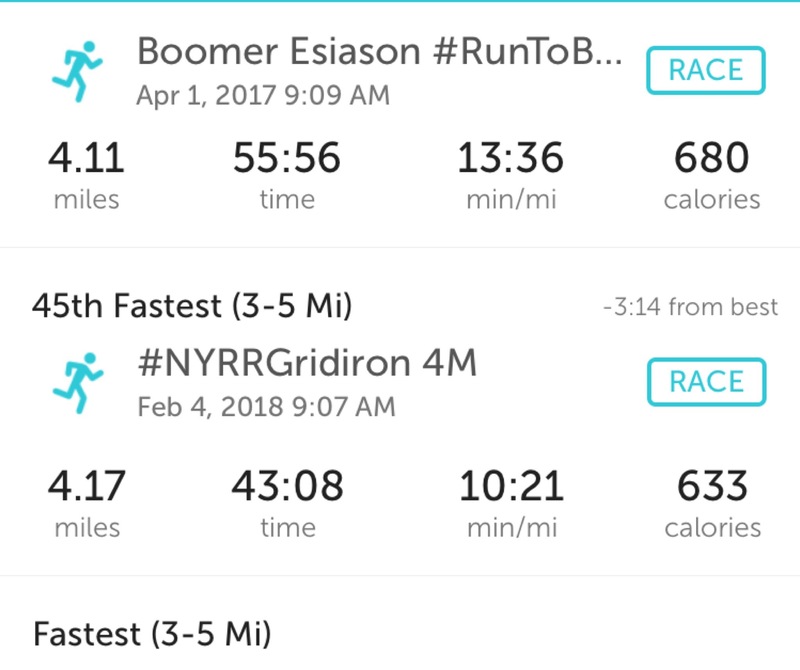 I commented in one of the Run the Year sub Facebook groups that I was I was “surprisingly” more nervous about the four miler than I had been about the Half. I finally put it together when laying out flat me. It’s the first race where I set a time goal (well 2). Speaking of Flat Cari, the “level up” to K before the Half was not a mistake, and shockingly I didn’t lose it after my pace during the Half. When I went to pick up my shirt and number for today I asked about that and the NYRR staff said it’s based on best pace in last window, converted to a 10K, not average pace. So I may hang onto it for the year. Some of yesterday’s errands include the NYG tee, pictured. Yes, I was violating “nothing new on race day”, but since it was atop two well worn layers I didn’t anticipate an issue (and it was fine). And yes, I finally figured out how to attach the bib to the belt so I didn’t have to do shorts on leggings thing. Rest of flat Cari: black TekGear with thumbholes, good because I forgot my gloves, Ted Corbitt race shirt, which I love (don’t like today’s at all, it’s white). August shoes which are about out of mileage 😮 and spiderweb tights. Neck is the turtle fur muff I love. Was meant to try GU Chews, but they didn’t happen so I went without fuel. Starting at E. 102nd made it easier to get there, but I much prefer to hit Cat Hill on fresh legs. I didn’t exactly have a strategy for “racing” this so when we crossed the start, I just ran my race. 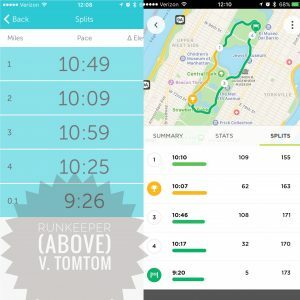 but did I run TomTom’s or Runkeeper’s? Those splits are nuts for the first mile. While I’d love to claim TomTom’s, I’m pretty sure Runkeeper’s is more accurate based on the early crowds and what I saw of the clock at mile one. 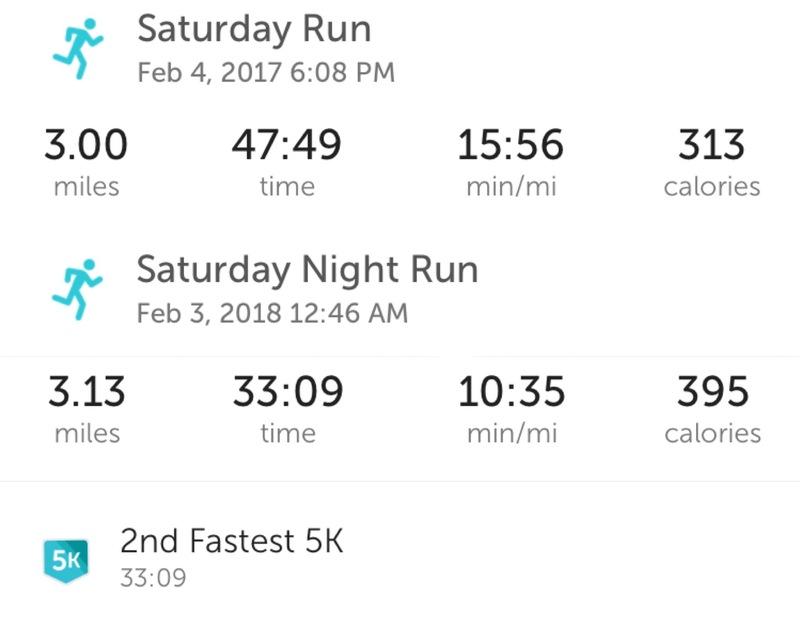 I could not figure out why this four miler felt so hard until I saw these splits. I’d maintained “that pace” (10:54) without the control of the treadmill. Mile 3 includes Cat HIll and I’m impressed I kept it under 11 as that also included walking through a water station due to crowds. Beyond this, I don’t have any particular thoughts on today’s run. I felt as if I was zig zagging a lot more, maybe because I was in thick of pack through finish? I loved the run left or right on Bethesda to “vote” for which team would win tonight. The reason I chose the Lebow hat vs. one of my handmade ones was that I expected to ditch it when I got warm. 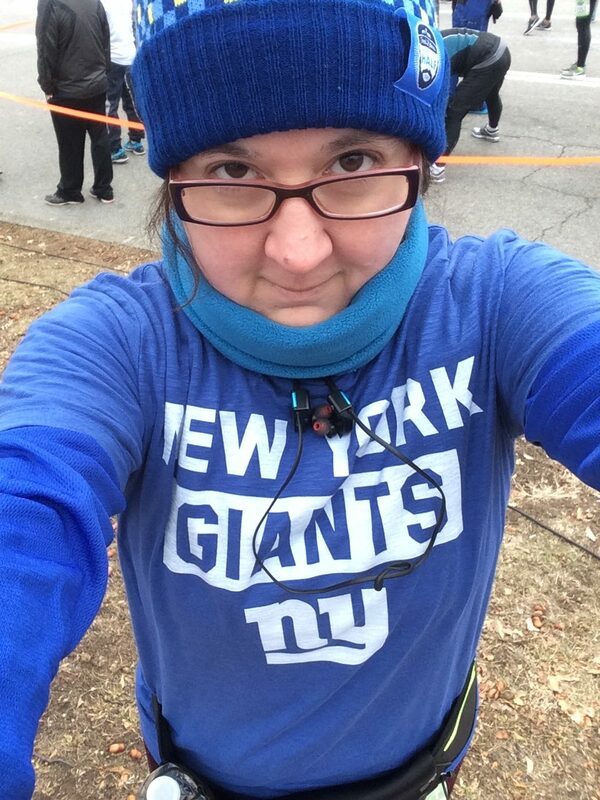 While I took it off at mile 2-3, I held it and I was glad because I got cold going home. I was also so cold/tired I forgot to flamingo. vs. Feb 4, 2017: buy three miles, get one free! I was on a runners’ high from how good Friday night felt, and then I was definitely on a runners’ high once I got home and saw this. 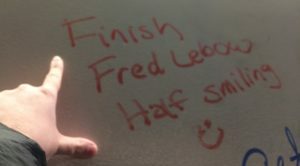 While I can’t say that I trained for the four miler specifically, it’s clear that running and training has paid off. That’s even forty seconds per mile faster than the 5M at the end of October. I’m really excited about what I’ve learned my body can do. I think I’m going to spend the weeks of 2/26 and 3/4 working on speed because I’m definitely going to “race” the Frozen Penguin. A PR isn’t a goal there, as it was my very first run and a brutal day, but I may set a time goal TBD. Why those weeks vs now? 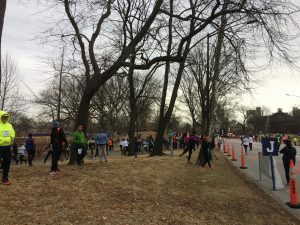 April 8 – Cherry Blossom 10M in DC. I treated this week’s runs as week one of training so I’m only a week behind. Determined to be properly trained for this one and, knock wood, I think I will be. 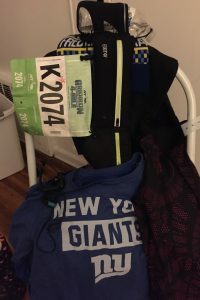 May 19 – Brooklyn Half. That just happened this week. Ends at the Coney Island Boardwalk! That’s literally all I know about this one, so need to do some homework. Never run in Brooklyn before. Congrats on your improvement and being brave enough to go for more! I think a February half in Florida sounds awesome, altho the heat and humidity may be a bigger challenge than the distance! Good luck! Thank you! Luckily it’s a 6AM start so heat hopefully won’t be too much of an issue. Also looking forward to the sea breeze as a good stretch of it is right along the Atlantic. 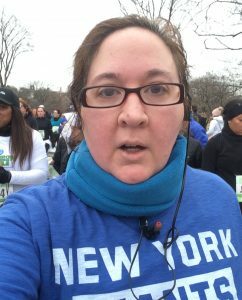 I’m not running any of the races you’re signed up for this year, but I did run the Cherry Blossom 10-Miler about 5 times several years ago. Thanks for linking up and I hope you’ll be back for next month’s Race Linkup! Thank you! I plan to. Added you to my sidebar, which is how I keep track of everyone. I’ve heard wonderful things about the Cherry Blossom race and have always wanted to visit DC that time of year, so it was a no brainer. I’m very curious to see what my times look like for a couple of 4-5m/10Ks in June after this long distance spring. No, I’m doing Manchester, which is two weeks before London – I’ll be at London cheering my running mate and training companion Bernice on though and am considering going for a charity place for next year, just to have done it.